The new 2018 GFQ catalogue contains all important information and dates regarding the GFQ Akademie’s CAQ.Net user workshops. Whether you are using APQP.Net, Compact.Net or REM.Net - The user workshops are the perfect addition to the CAQ AG software family. 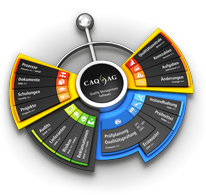 Our all new Quality Assurance with CAQ.Net / Quality Management with CAQ.Net workshops in English may be of particular interest to you.